When anyone experiences a slip and fall accident in the Newmarket area, the owner of the property, retail mall, office building, restaurant or other business facility, may be held responsible for compensation for injuries. 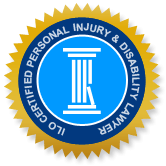 If you have been injured in Newmarket due to a slip and fall or other accident, you need the help of an ILO personal injury lawyer to build a successful case based on your individual experience and obtain fair compensation for your suffering, rehabilitation, medical expenses and lost wages. Property owners in Newmarket are encouraged to perform periodic property inspections. Foremost, there is an expectation that infrastructure such as broken sidewalks, loose handrails or worn carpeting be repaired immediately to prevent an accident from occurring in the first place. If the damaged property cannot be fixed in a timely manner, the property owner should at least post "out of order" or warning signs at strategic points around the slip, trip and fall hazard to alert customers of the potential for accident and injury. If you've ever spent time inside a coffee shop, fast food restaurant, or other large franchised operation like a Starbucks or a McDonalds, you'll notice employees frequently walking around to inspect the floors for spill hazards and if they find one, a hazard sign is immediately erected and spills are cleaned as soon as possible. Regular slip, trip and fall inspections, several times during the day, are an excellent practice for any company, especially one that sells food and drinks that may result in slips if dropped on the floor. Employees should document their inspections in writing by filling out a report in order to provide a record of their inspections, which may be required as evidence in the event of a slip and fall negligence accusation. Newmarket businesses must take slip and fall accident prevention very seriously, as the costs of a slip and fall negligence suit may be considerable. Injuries to patrons, clients or the general public are clearly undesirable; as well, steps can be taken to avoid staged accidents, slip and falls that are fraudulently carried out to create a case for a lawsuit. Technology may be used to provide a visual account of the exact circumstances that surrounded the alleged slip and fall accident. The most common tool is security cameras. It is in the best interests of a store, restaurant or other business to install cameras to film all locations within and outside the facility for the purpose of potentially using the film as evidence of the company's innocence. If a business has visual evidence of a staged slip and fall incident, there is a high probability that the footage would exonerate the business from a negligence suit and consequently, avoid a sustained legal battle and expensive litigation in the courts. In today's high tech world, properly placed surveillance cameras can help businesses rest easier that they will not be the victim of a bogus slip and fall accident claim. On the other hand, if an establishment has not taken the time or trouble to place security cameras at strategic places throughout the property, the business owner is vulnerable. It is a reality that slip and fall injuries happen every day. If everything is being done to reasonably ensure that slips and falls are avoided, to inspect property regularly and document inspections in writing, and to provide video footage of any accidents, a business will significantly reduce the risk of slip and falls suits against their company. As property owners, we owe it to our clients to provide a safe environment for people to carry out their business with us, whether our clients are making a bank deposit, ordering a cup of coffee or buying a pair of boots. Slip and fall accidents are not limited to the interior of buildings; many occur on walkways particularly when not cleared of ice in the winter. In some cases, municipalities fail to take proper action to maintain public buildings or walkways. Claims against Ontario municipalities differ from claims against private business owners, particularly with respect to notification of the incident. Contact the Personal Injury Lawyers of Ontario (ILO) office as soon as possible to ensure that the negligent party is appropriately notified of your claim. ILO attorneys have vast experience in slip and fall claims - you may review testimonials to see how we have handled cases similar to yours. We offer a free consultation and in most cases there are no fees unless we are successful in winning your case.